During the Arklow Camera Club exhibition in the Bridgwater Centre, people were invited to select the photograpgh they felt was best in exbibition. Once the scores on the doors were totted up, Kieran Lynam’s, North Quay Arklow proved to be the most popular. 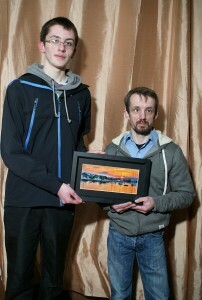 Pictured is Peter receiving his prize from Kieran Lynam who took the winning photo.